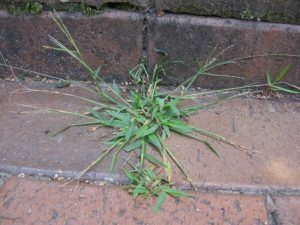 Crabgrass Pre-Emergent — chemical pre-emergent application for your lawn — how to “time” an early Spring application of same. First, you’ll want to be sure you are seeing Forsythia in bloom (sometimes people confuse Hamamelis, Witch Hazel, with Forsythia, at this time of year) – I am not doubting you, just seeking knowledge certainty. However, even if Forsythia were just starting to crack a few buds, now is not the time to pre-emerge! When the early warm-up tends to cloud people’s interpretation of the best time to apply the crabgrass pre-emergent, we often tell them to wait until they have just mowed the lawn the first time because the lawn’s active growth required a first mowing. Pre-emergent materials may also have some trouble getting to the soil if there is matted grass from winter; hence, a gentle lawn raking is a good idea before applying the pre-emergent. If your pre-emergent of choice contains “Dimension”, then any small crabgrass plants that did sneak in an early germination (before you got your pre-emergent down) will be “post”-emergently killed by the Dimension chemistry (nice bonus of using a little Dimension). When you know you have a full-blown Forsythia bloom, and you’ve just cut the lawn for the 1st time, or will be cutting very soon, then you’ll know your pre-emergent application is right around the corner, after you lightly rake and mow once. As with any lawn product, avoid impervious surfaces to prevent runoff that finds it’s way to ground water sources. As established plants tolerate pre-emergents fairly well, you can often overlap applications into shrub beds without a problem. In fact these landscaped bed edges are prone to breakthrough, so covering edges are a must. If you should have any further questions, please do not hesitate to contact our office. We are always here to help.